The purpose of Engage is to be formed spiritually. 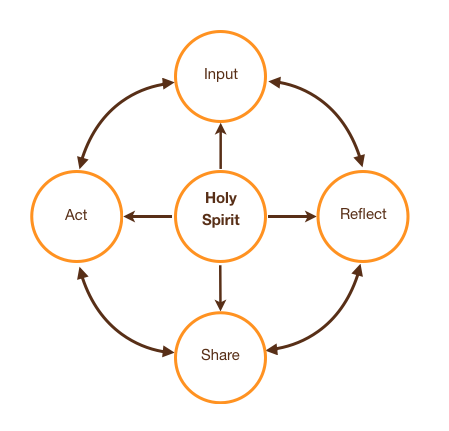 We believe that spiritual formation is the growth and movement people experience as three realms of their life become more fully integrated: Belief, Feelings and Actions. We recognize that people are being spiritually formed by their choices and influences all the time, and as followers of Jesus, we want our lives to be formed in Christ through the empowerment of the Holy Spirit. Sowing seeds is our responsibility. 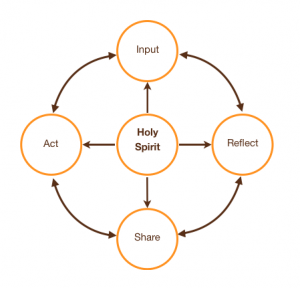 As facilitators of Engage groups we recognize that it is the Holy Spirit who prepares people for spiritual formation. In Matthew 13:1-9 Jesus told the parable of the seed in which a farmer sowed seeds in a field. The seeds fell on different types of soil, only one of which was good. Just like in the parable, we are responsible to sow seeds but it is the Holy Spirit’s responsibility to prepare the soil. Questions are our primary tools. Rather than function as teachers or experts we will use questions to help us engage in creating safe space. Through the use of questions we will open conversations and allow participants to engage in self discovery in partnership with the Holy Spirit. Stirring is our methodology. Facilitating movement towards integration of the three spheres (belief, action and feelings) happens within the context of stirring. The purpose of stirring is to challenge and disrupt the patterns of thinking, behaving and feeling into which people naturally settle. Input The facilitator will chose various inputs such as books, articles, videos, intentional conversations, etc., to create a theme for the group. Interacting with the theme will increase the participants’ pool of understanding and help create positive dissonance. Reflect “If you can think it but cannot say it, it is not a thought. If you can say it but you cannot write it, it is not a clear thought.” Using this saying as a basis for part of our formation, writing about our interactions with new ideas will help to create new thinking and feelings. Share Bringing our thoughts and feelings to the group will allow for more input and the potential for even greater holy tension. Act New actions cement new thoughts. Members will be encouraged to allow their input, reflection and sharing to move into the realm of practical living and doing.